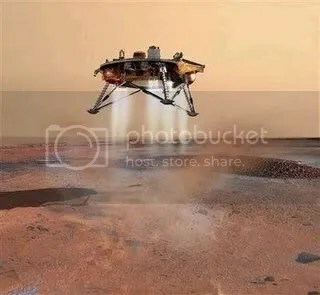 NASA Spacecraft Makes Historic Mars Landing! The Phoenix Mars Lander whirled through space at 120,000 mph to complete its pre-progammed touch down on Mars this past Sunday. When the craft landed successfully on the “Red Planet” a roomful of NASA scientists exploded with applause….NASA, has not had a successful “soft landing” in more than three decades since the twin “Viking” landed back in 1976….Ed Sedivy (program manager at Lockheed Martin Corp which built the “Phoenix” )described the landing this way: “We evolve out of this cacoon an spread our wings and we turn into this beautiful butterfly on the surface”…. Launched last summer , the “Phoenix” traveled 422 million miles over the past 10 months. The cost of this Mars mission? Approximately $1 million dollars per mile which–comes out to exactly $422 million dollars! This entry was posted on May 27, 2008 at 2:36 pm and is filed under Mars, Phoenix Mars Lander. You can follow any responses to this entry through the RSS 2.0 feed. Responses are currently closed, but you can trackback from your own site.